Historical middle-grade fiction about a 12-year-old Scottish girl forced to flee her home and travel to the New World in the year 1692. Debut novelist Macreery tells thestory of Dory MacDonald, a survivor of the massacre of Glencoe, an attack on three Scottish settlements ordered by the king of England in the late 1600s. The book begins as the MacDonald clan is ambushed by members of a rival clan in league with William of Orange, the British monarch. Dory, along with her parents and a small fraction of her clan, escapes the attack. As the group takes cover in the freezing woods of the Scottish Highlands, Dory’s mother falls ill and dies. Before Dory can even confront her grief, her father insists that she leave Scotland and travel to the New World, where she may take refuge with her mother’s sister in a place called Massachusetts. Although devastated by her apparent banishment, Dory comes to understand that since she is the granddaughter of her clan’s chief, she has a duty to survive. 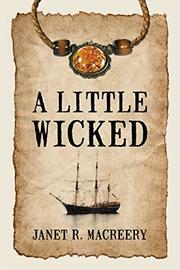 As war continues in Scotland, Dory must get to safety to preserve the history of her people. She thus begins a journey, first trekking across Scotland and then traveling the sea. As Macreery depicts the difficult voyage, she emphasizes Dory’s loneliness and fear while providing fascinating details about Scotland’s people, terrain and wildlife, as well as the hardships of ocean crossings in the 17th century. When Dory finally arrives in Massachusetts, the action continues as she finds herself in the midst of the famous Salem witch trials. Macreery’s well-researched story is chock-full of historical information seamlessly woven into Dory’s quest to extricate herself from one dangerous situation after another. In light of the death and devastation presented throughout the book, this story isn’t for the faint of heart. Regardless, the fast pace and suspense-filled pages will keep younger teens engrossed while providing notable history lessons. A high-stakes historical adventure full of emotional, social and political drama.